The pOcpac iPac 3X is the latest generation of waterproof phone cases that perfectly fits the iPhone 6/ iPhone 7 and similar sized smartphones. 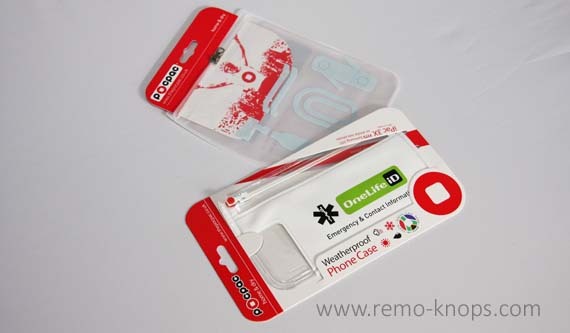 The pOcpac OneLife iD iPac 3X comes with the OneLife iD miniTag and an ICE screen for your smartphone. pOcpac also offer a cycling pOcpac range to pack your tools and important stuff on the go. I will also do a quick comparison with the Banjo Brothers Jersey Pocket Cycling Wallet, that I’ve reviewed a little while ago. The pOcpac iPac 3X is made of tough plastic which is sealed on the edges. Cleverly the zipper is not placed on the sides, (where both iPac halfs are sealed together) but with a little offset from 1 cm from the side. The pOcpac OneLife iD iPac 3X has a small divider like the Banjo Brothers Jersey Pocket Cycling Wallet but there is no reinforcement band on the edges. Compared to the Banjo Brothers Jersey Cycling Wallet the pOcpac iPac 3X is slightly smaller. However the pOcpac iPac 3X feels tough and durable. My outdoor-smartphone perfectly fits the pOcpac iPac 3X, the Redmi Note 3 unfortunately doesn’t fit. You can see the OneLife iD logos and branding on the frontside of this special version pOcpac iPac 3X. When you look through the transparent backside you see a pOcpac logo as well. The zipper is sealed into the pOcpac and doesn’t have teeth like the YKK self-locking zipper on the Club Cycling Pouch, but has a similar design as the zipper bags. 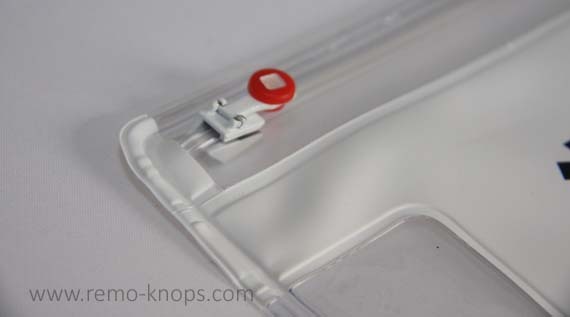 However you do have the normal metal zipper part that pushes the two sides of the zipper together. It feels like sliding when you close the zipper, however as long as it keeps your phone waterproof, it doesn’t matter. Professional riders of Team Sky and Quickstep are using the OneLife iD wristbands,where I can recall the special pink version for the Giro d’Italia last year. Together with your order, you get a voucher code and instructions to create (and order) your custom Onelife iD Minitag. With the creation of the Onelife iD Minitag you also create the OneLife iD profile that is printed on your Minitag. The delivery of this Onelife iD Minitag can take up to 10 working days because it is custom made. An instruction how to activate your OneLife iD profile comes with the delivery confirmation of the Onelife iD Minitag. When scanning the QR-code from the OneLife iD Minitag, you will also be redirected to the OneLife iD profile. Additional medical information can be added. The OneLife iD profile is also the place where you can set-up and download you ICE Phonescreen. In my opinion this is a great example how the digital and physical world come together. Roadeavour is a good one as well. Which of the Roadeavour cases do you use? Hey!, I found this information for you: "pOcpac iPac 3X review – OneLife iD version". 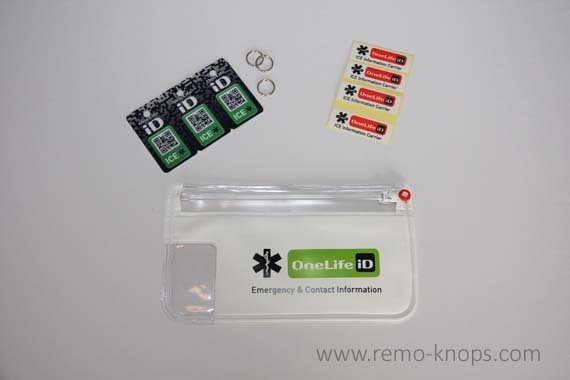 Here is the website link: https://www.remo-knops.com/6113/pocpac-ipac-3x-review-onelife-id-version/. Thank you.